With the facility for up to 20 covers, Beechcroft becomes an ideal venue for family celebrations or for a small conference. 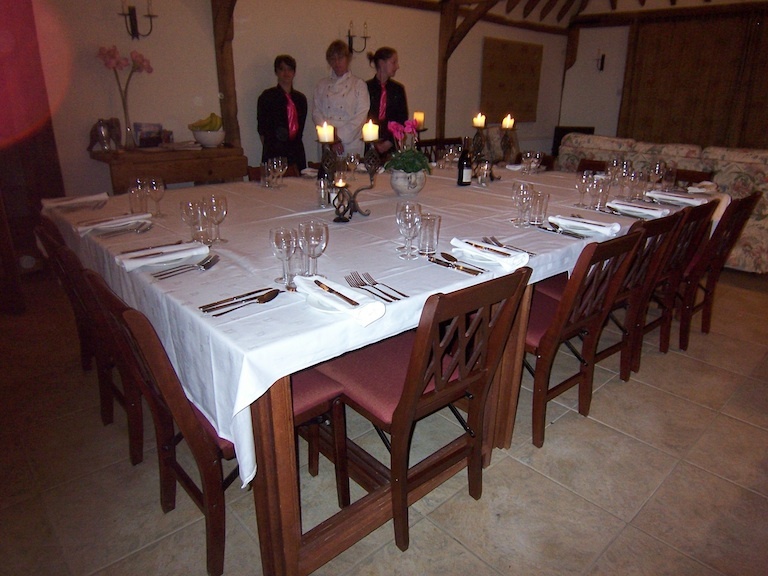 Beechcroft can sleep up to 17 guests in total, 6 in the Granary, 5 in the Oast House, 4 in the Byre, and 2 in the Bull Pen and Cart Lodge which has the capacity to seat up to 20 and a kitchen capable of catering for such numbers. Outside catering or special gourmet ‘takeaway’ services may be provided by prior arrangmement. With the accommodation split into 4 cottages it gives the flexibility to have your own space whilst enjoying the company of friends and family. Romantic breaks for 2 guests. Spacious and full of character for 4. Moving house, having a new house built, have a few weeks between selling your old house and moving into the new one or having to move out whilst essential works are being undertaken on your home? Why not take a serviced short term let/break in one of our cottages during low and mid season. Self-catering at Beechcroft is easy – and follows the same conditions as our holiday lets – but for a fixed term of 30 nights – at a suitably reduced rental! Enjoy all the benefits provided with towels and bed linen laundered together with an assisted clean undertaken once per a week. Home from home – All you need to bring are your clothes and food! Availability can be checked on individual cottage pages. Please email us at enquiries@beechcroft.org with your requirements and if you have any queries please do not hesitate to ask. Beautiful place, lots of space, peace and quiet. We loved it! Great Base for a lovely part of the country. Lovely location, had a great week. Didn’t do half of what we could have done – one week’s not enough. We have stayed in many English cottages, this is absolutely the best. We enjoyed the excellent facilities and surroundings. Thank you.